Terve velipoika! Hello big brother! Mama and I thought you would be delighted to hear from us so I’ve made a little advent letter to you. Do you remember this sight? Doesn’t our park look beautiful this time of the year? There are lots of Christmas lights but we also have the special lights in the sky! What a magnificent sight it is! 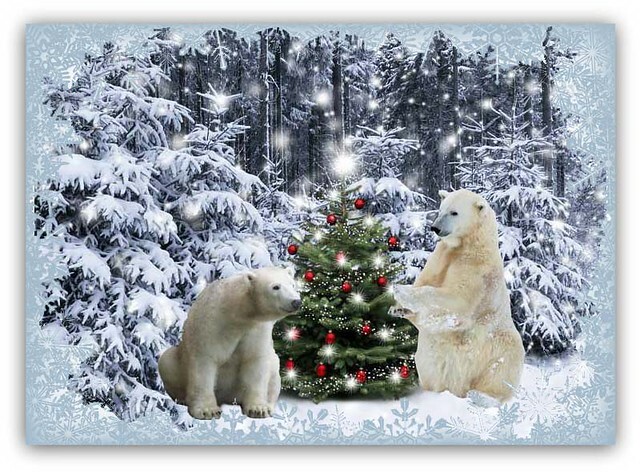 Mama and I are, of course, thinking of you and hope you and Nora will have lots of snow and ice this Winter. Here the snow came quite late but we hope it will stay! 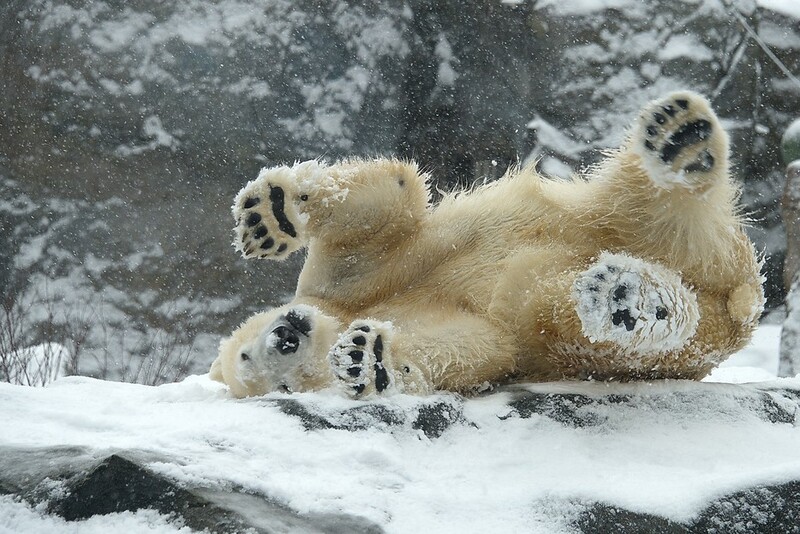 I love to lie in the snow doing nothing! I think this kind of ‘exercises’ would do good even to our two legged friends! They’re always making so much fuss about Advent and Christmas …. they really should roll in the snow every day. I’m sure they would feel more relaxed then! 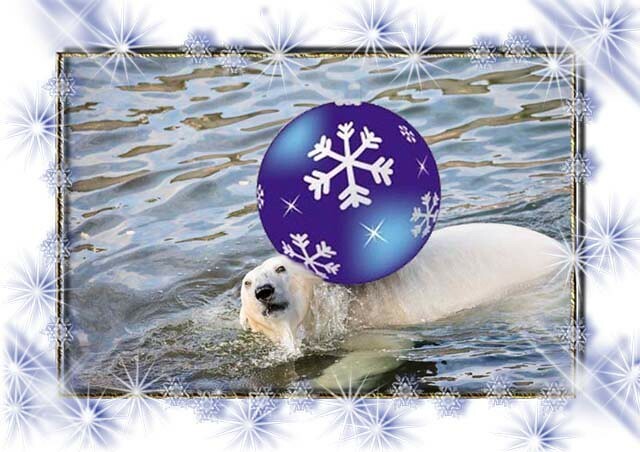 As you can see I have a king size Christmas ball, too! I have already met Santa when he and his reindeers were rehearsing before the Christmas. 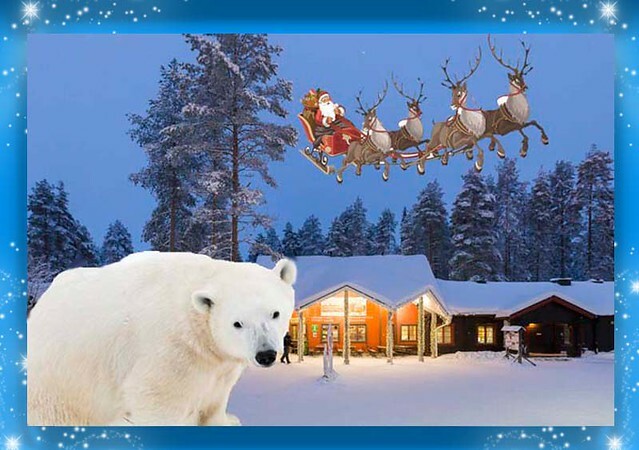 Santa wants everything run smoothly when it’s time to visit children all over the world. He also promised me to visit all polar bears living in the wild. Santa sure is a jolly good fellow! I’ve seen photos of you and Nora looking so happy together. I have a dream of being together with a girl bear, too. I don’t want to tell you who she is but her name begins with the letter ‘Q’ ….. It would be so nice to decorate a Christmas tree together with her. I have a small friend helping me light the candles. Now I’m counting days – and nights! – to Christmas Eve. Oh bear, I don’t think I have enough claws. Oh well, mama can help me. She’s a very wise lady knows everything!! Happy Advent time to you and your sweet Nora! 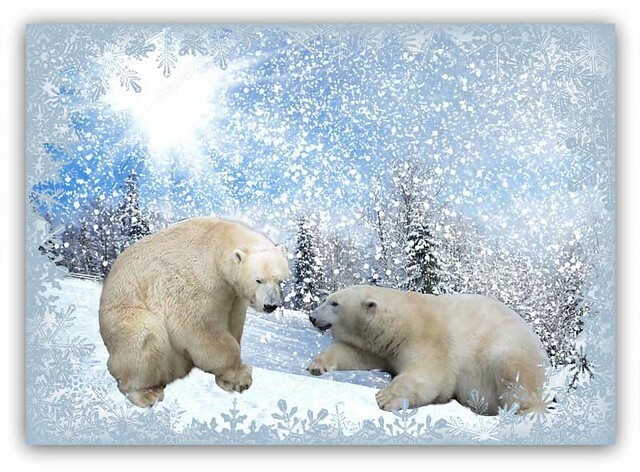 I made this card for you and I must say you both look wonderful in the snow! Now I’m going to dream my secret dream again! This letter is adressed to you but I will take this opportunity to wish all the readers of Knuti’s Weekly, too, a very happy Advent time! creating all these lovely collages. to have the white stuff. wunderschöne Collagen zeigst du uns mit Sisu und seiner Mutter! 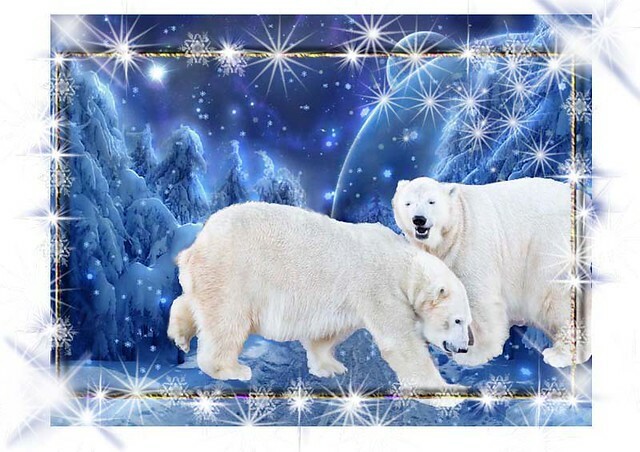 Der Schnee ist da und bleibt hoffentlich, das ist das Beste für die Eisbären im hohen Norden. Danke dir für diese schöne bärigen Bilder im Advent. Thank you for so nice story and all those beautiful collages! but I know, that they got it a little bit, too. 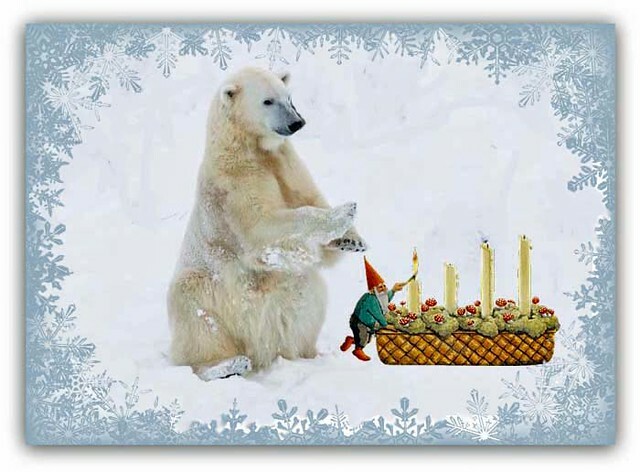 I wish you a peaceful Advent time! da wird sich RANZO freuen über die feinen Bilder und Grüße von SISU. wetteifert mit der festlichen Beleuchtung am Eingang von Ranua! bestens aus und der tolle Schnee ist im hohen Norden garantiert. Wünschen für eine friedliche Vorweihnachtszeit! …..und ja, ich liebe den Schneeflockenfall in der Weihnachtszeit hier im KWM !!! It is great that Sisu wrote a letter to his brother Ranzo. The collages are wonderful. Thank you for the lovely story. TERVE!, SISU, ‘our’ little LAUSBUB! Did auntie MERVI help you to enjoy us – or rather your big brother RANZO in VIenna/AUSTRIA this time! – with another letter despite of lots of pain she has to stand actually on and in several parts of her body. So, let us first wish her she takes all the time she needs to hopefully fully recover from all her bodily harm (hoepfully no mentaly harm in addition!) in an – for HER – acceptable and ‘refreshing’ time! I guess your park – the RANUA WILDLIFE PARK – looks smashing all year long! 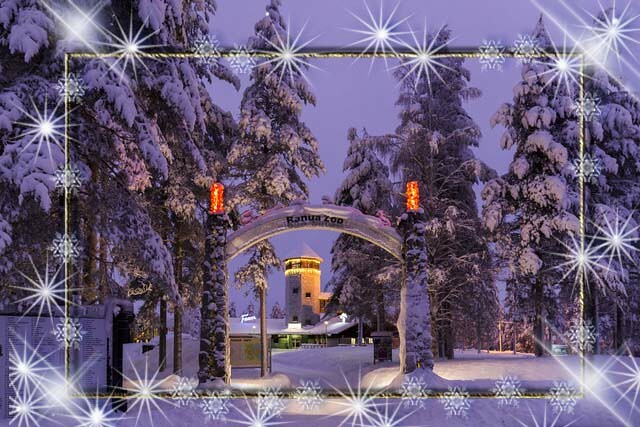 But you are right: the winter charms – if there is snow and candle light (and the Northern Lights in your areas in addition!) and various pleasant smells in the air that reminds us rather ‘oldies’ of the days of our childhood and youth – are something very special and most delighting! Oh, what fun it would be – despit of our old bones! – being able to roll in the snow with YOU and your pretty mother VENUS! your fairytale-like home enclosure is just a bit far away from ours . . .
– > – > OMG! – Blush – Due to your letter to your brother I just notice I made a big mistake in the ‘Back Room’, as I mixed up ‘bella NORA’ with ‘bella LYNN’ who celebrates her 7th birthday today (she, that’s LYNN, is even no more in Vienna with RANZO and NORA but in Copenhagen/DENMARK: https://www.zoovienna.at/ueber-uns/presse-archiv/welteisbarentag-im-tiergarten-schonbrunn/ ) . . . Oh no – my memory capacity vanishes more and more completly . . . Sniff and Howl!! . . . 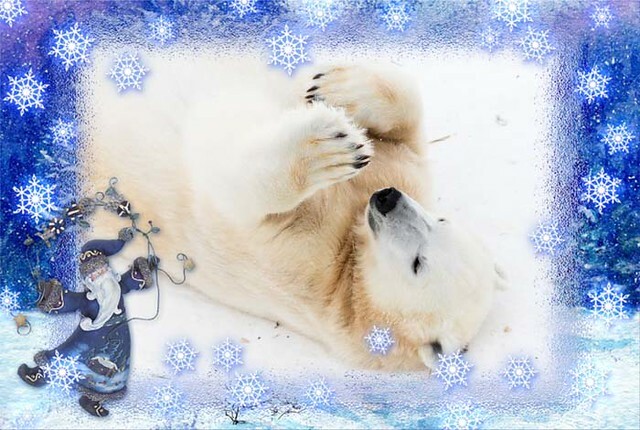 Thank you, dear MERVI: wonderful letter + collages with the polar bears, the snow and all the winter-white and -blue ! Im letzten Bild möchte man sich einfach ganz still und unbemeerkt zu Dir legen und die Ruhe genießen! – allerdings, fürchte ich, müsste mir zuerst auch noch so ein schöner weißer Pelz wachsen (oder ruhig auch ein brauner, aber der würde dann nicht so gut zur weiß-blauen Landschaft passen . . .
. . . . I don’t know who it is, LYNN or RANZO but that’s a pic ‘of a first day of SNOW in VIENNA’. Dumba – Errare humanum est! 🙂 🙂 🙂 I keep mixing up things all the time! Thank you for these beautiful first steps into the time before Christmas. 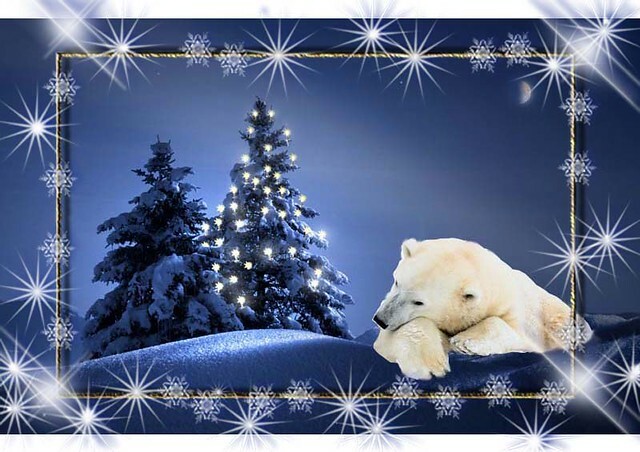 Again you created wonderful and imaginative collages around a cute story suitable for the Advent season. The last one reminded me strongly of our little dreamer Knut. Like Britta-Gudrun I love the snowfall in KWM. Ranzo must be very happy when receiving this letter from his younger brother. I love this card from Sisu to his brother in Vienna. You have always treated us at this time of year. 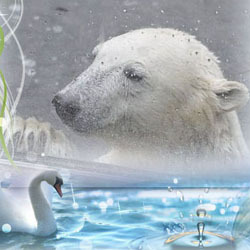 The magic of Polar Bears is especially strong in Winter. Thank you very much for the wonderful Pictures and the funny story. I Love your Christmas-Stories. I wish you and Vesa a pleasant 1. Advent! Wunderschön Adventgruesse habt ihr für Ranzo gemacht! das ist aber schön, dass Sisu an seinen großen Bruder Ranzo denkt, und ihm so wunderschöne Adventsgrüße schickt. Darüber wird er sich sicher sehr freuen. Mervi, Du hast wieder ganz tolle Collagen “gebastelt”. Danke. You have made a wonderful and sweet surprise for your brother Ranzo (with a little “big” help from Auntie Mervi). 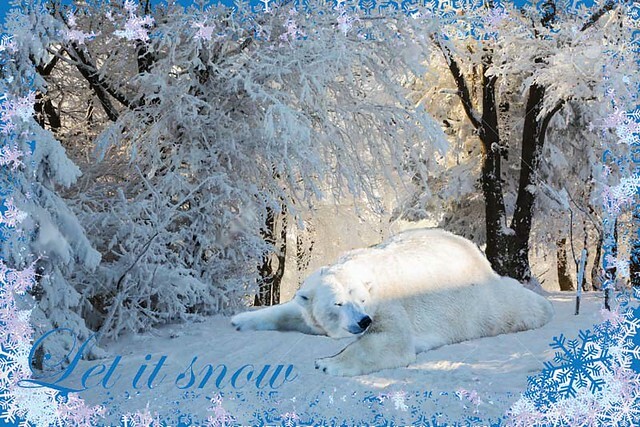 It is great to know that you and mommy will have lots of snow, but most probably, Ranzo and Nora may have their fair share of the white stuff too. And now, we all can look forward to Xmas time. Log in | 53 queries. 0.844 seconds.